Sightings of two of the largest species of Hawkmoth caterpillar to be found in Africa have been received in the last few days. 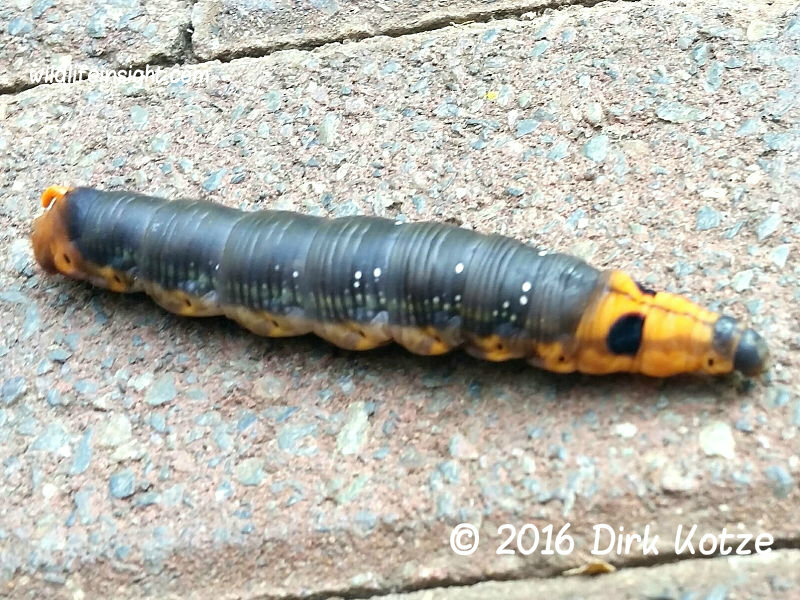 Dirk Kotze came across this Oleander Hawkmoth caterpillar, Daphnis nerii, at Little Falls in the Walter Sisulu Botanical Gardens in the Gauteng province of South Africa. The caterpillars reach 110mm in length and vary in colour. Like many Hawkmoth caterpillars they are most frequently sighted when wandering in search of somewhere to pupate. The Death’s Head Hawkmoth, Acherontia atropos, caterpillar shown left was seen in a South African primary school playground and photographed by Juillard Sandrine. These huge caterpillars, up to 125mm in length, are also extremely variable in colour as seen in the Death’s Head Hawkmoth update. Many thanks to Dirk and Juillard for their sightings. An African caterpillar gallery featuring photos received of other species will shortly be added to the galleries pages so please keep forwarding on your sightings. Other recent caterpillar identification enquiries have included Scarlet Tigers in the UK, more Tent and Woolly bear Tiger moth caterpillars from the States, an infestation of Philotherma rennei caterpillars from South Africa – many of which have since pupated and the moths begun to emerge (report to follow). Reports of moths emerging from overwintered pupae of caterpillars being reared have also begun arriving – often with much excitement – always good to hear of successful outcomes.